Port-O-Rack Drying Rack - 50 Shelves 20"x26"
Without a special drying rack, art projects can literally take over a classroom and leave you with no space while work dries. 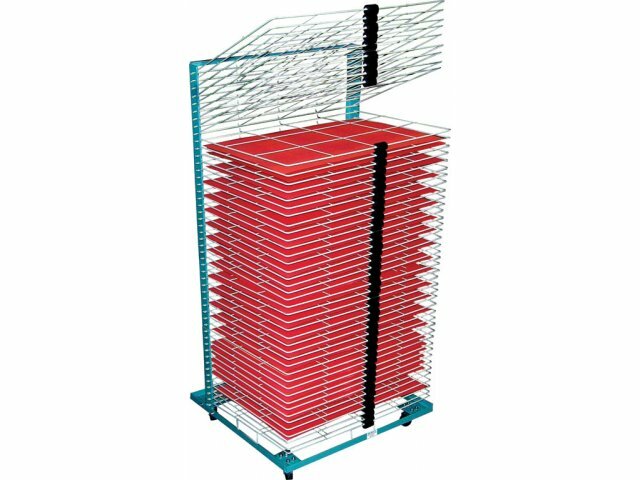 Depending on how many sheets have to dry at once, these drying racks let you dry projects from an entire class while taking up minimal space. This medium capacity, 50-shelf unit works well. One unique feature of the Port-O-Rack design is that it allows narrow, rigid products such as fiberboard, cardboard or plastic to extend beyond the individual shelves. This drying rack features a new frame design for faster assembly so the 50 lightweight shelves snap into place quickly and easily. Rubber bumpers maintain the proper shelf spacing while all steel-construction provides a super-sturdy frame. 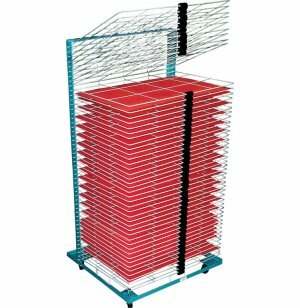 Ultimate Durability: Racks boast an all-steel construction that will serve you well for many years without warping. Wire-reinforced shelves and rubber bumpers between the shelves ensure neat, stable stacking of your projects. Mobile Convenience: With swivel casters, this lightweight unit can be moved smoothly and easily to wherever you need it. Space-Efficient Design: Keep your classroom or art studio in neat order with these racks, using only a minimum of space to dry a large number of projects without crowding. Unique design also provides storage space for oversize projects to extend beyond the shelves. Easy Assembly: Shelves snap into place effortlessly within minutes.